We are happy to announce new platform support for Grand Theft Auto V, please welcome PlayStation 4 (Orbis). We never actually thought this will be possible, but files for PS4 version of GTA V are available, so why not? Features. As always in the beginning of the support for new game or platform, not all OpenIV features are available. As for now, we have basic support for Archives, Textures, Models, Collision Bounds, NavMeshes and Audio files. You can open all those files in inbuilt OpenIV tools, but there is no openFormats exporting or editing capabilities. Since PS4 have some specifics in GTA V RAGE Resources please consider this support as BETA and report any issues you may encounter. Please do not expect same level of features support as we have for PC version. Files. You might also have question, where to get the PS4 game files. We cannot answer this question; this is something you need to figure out by yourself. You need to have game files on your PC. When you got the files, you also need decrypted version of eboot.bin, if you have the files you probably already know where to get it. As our first step in GTA V Animations support, we added new feature for playing vehicles animations. In the model viewer if vehicle has animation you will see controls for playing it. You can play animation forwards and backwards. We will continue our work on GTA V Animations support and you will see features like cutscenes player and openFormats support in the future. • Play multichannel audio in mono mode – OpenIV will mix all channels into one mono sound. 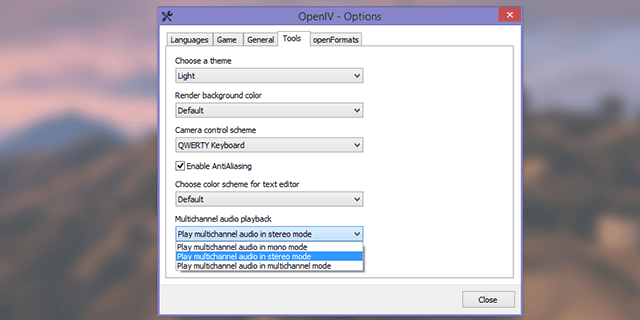 • Play multichannel audio in stereo mode – OpenIV will mix channels into two channel stereo sound. • Play multichannel audio in multichannel mode – OpenIV will not mix any channels; this is how it worked before this update. Unfortunately, in most cases you will not hear anything expect for left and right audio channels. You probably will hear all sounds only if your system is capable of playing surround sound. To provide the best experience for all users option is set to “Play multichannel audio in stereo mode” for default. This option only affects audio playback in the OpenIV’s tools such as Audio Player and GTA IV Cutscene Player, the export functionality is not changed. OpenIV Audio Player is now also has ability to export multichannel audio in stereo or mono mode. • We added openFormats support for YVR resources in GTA V. Those files are prerecorded vehicles paths that are used in cut-scenes (and maybe scripts). It’s not big or heavily requested format, we added it just because it was easy and took only few minutes to do. • We added support for new shaders in openFormats for GTA V models. Those shaders added in the latest game updates. • We improved import process of .OXT openFormats for GTA V texts. It was processed keys with spaces incorrectly. • We fixed an issue resulting in crash while importing partial carcols.ymt file from META/XML. • We fixed an issue when edged faces rendered incorrectly for GTA V ped models with cloth geometries. • We added new names for objects and models from latest updates. You will see normal names instead of hash values in ymap/ytyp files in the latest GTA V DLCs. • We added many new names for audio tracks in GTA V. Animals, weapons, vehicles, DLCs, all kind of stuff. • We fixed an important issue in GTA IV Cutscene player, which was the reason why objects positions not synchronized in the scene. • We fixed an issue when GTA IV Cutscene player was not able to animate scene without audio file. • We fixed an issue when GTA IV Cutscene player did not load audio files for some episodes cutscenes. Those cutscenes uses audio files form original GTA IV audio archive. • We fixed an issue in GTA IV Cutscene player when it was not possible to control free camera while camcorder overlay is shown. • We fixed an issue in GTA IV when some audio files mistakenly presented as multichannel sounds. • We added many new names for audio tracks in GTA IV. Mostly for Episodes. • We improved support for .GXT files in Max Payne 3. • We added few new names for audio tracks in May Payne 3. • We added new option to start OpenIV with location from the last session. We use this option for a while now, and it pretty useful and amazing. This option is disabled by default, but you should definitely give it a try. • We made many changes in main window menus: Edit menu reorganized and all new features from context menu added. Context menu and extended context menu also reorganized. We added extended context menu few versions back, but forgot to mention it here in the news. To invoke extended context menu instead of default one press and hold Shift. • We added ability to close folders which opened through “File > Open folder…” feature. • We added new option to display confirmation dialog on exit. This option is disabled by default. • We fixed an issue resulting in OpenIV crash while importing some DDS files. • We fixed an issue resulting in incorrect order of channels in exported multichannel WAV. • We added ability to export multichannel audio as stereo or mono WAV. 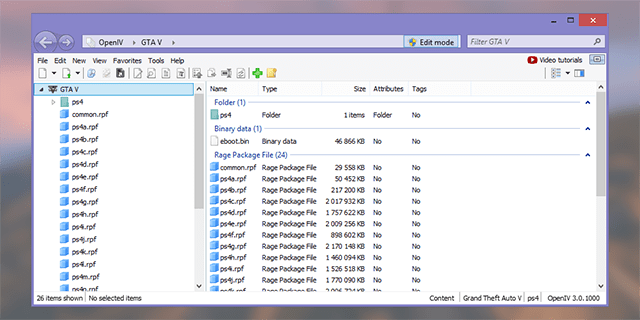 • We fixed an issue where OpenIV was not able to open folders if they was drag-n-dropped into game folder using Windows File Explorer. • We added ability to change color of edged faces in model viewers. • We added context menus for all kind of elements in model viewers. • We added search box into OpenIV Texture Editor. • We added context menu for images in OpenIV Texture Editor. • In OpenIV Texture Editor when image list is focused, you can press char key to navigate to texture with name starting with this char. • In OpenIV Text Editor when search box is focused, you can press Enter to search next and Shift + Enter to search previous. 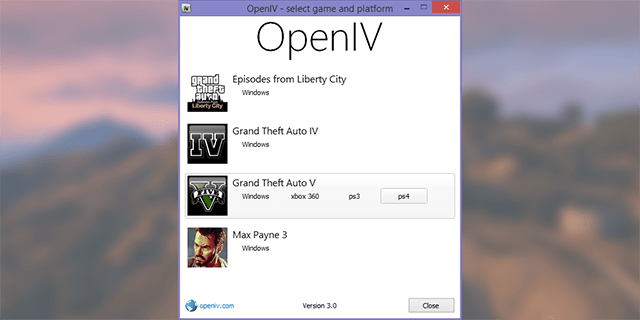 • You now can drag-n-drop OIV Package into OpenIV main window to install it. • We made some changes regarding DirectX11 initialization in OpenIV. • We add more debug information to catch some annoying issues. • We probably fixed some other bugs but forget to mention them here or in bug-tracked change log. • We probably made other improvements or changes but forget to mention them here or in bug-tracker change log. You can find change log for this version on our bug-tracker here. We now have community tab on our YouTube channel. We now have Discord server for OpenIV, you can join if you want. We now have OpenIV Patreon. You can support OpenIV if you want. We have an instruction how to translate OpenIV into your own language and we are calling for you to do so. You can find the localization guide on GitHub. As for existing localizations, you can find list of differences between 2.9.1 and 3.0 here. We want to say thank you to all our supporters on Patreon and other platforms. If you already have OpenIV, it will ask you for update next time you run it. If you still do not have OpenIV, you can use the link below to download it right now. Today we are releasing OpenIV 2.9.1. Open folder: You now can open folders the same way as archives. Use menu “File > Open folder…” and select folder you want to open. Selected folder will appear at the end of the list in navigation tree. Delete confirmation dialog: OpenIV will now show you delete configuration dialog, it will help you to avoid accidental removal of game files. You can disable this feature in OpenIV configuration. You can edit those files using inbuilt OpenIV Text editor or export them to META/XML format. • We fixed an issue where wrong High Level Code was generated in SCO Viewer. • We fixed an issue where it was impossible to use context menu on travel buttons (Back/Forward) when history list contain many items. • We fixed an issue where some users might get “Unable to initialize Windows DirectX subsystem” fatal error message. • We added ability to use keyboard arrow keys to navigate through shaders information in models viewer. • We made minor visual changes in “More information” dialog in models viewer. • We fixed an issue where users might see “Confirm edit mode” dialog while creating archive in edit mode. • We changed keyboard shortcut for creating new archive from “Ctrl + N” to “Ctrl + Shift + N”. • We added ability to use “Ctrl + N” keyboard shortcut for creating new archive in current location (Same as “Ctrl + D” for folder). • We fixed an issue where status bar does not updates when items are added or removed. • We fixed an issue resulting in unexpected behavior when double-clicking on group header in file list. • You now can use “Shift + Delete” keyboard shortcut for permanently deleting files while using Recycle Bin (This works for files on disk not for files in archives). • We fixed an issue resulting in “Edit mode” button become disabled in specific scenario. • We improved support for Junctions or Symbolic links. You now will be able to use global search while your game folder is Symbolic links. • We changed the way how Size column is displayed in file list. Now it works just like Windows File Explorer. • Some more changes was made, they are minor or are not worthy of mention. We have an instruction how to translate OpenIV into your own language and we are calling for you to do so. You can find the localization guide here on GitHub. As for existing localizations you can find list of differences between 2.9 and 2.9.1 here. Today we glad to announce new OpenIV Documentation Wiki. Currently this Wiki contain detailed description of OIV Packages, both version, 1.1 and 2.0. With time, we will add openFormats documentation in this wiki. In addition, we will add detailed description about how to translate OpenIV into your language. Since this is a Wiki, you also can contribute and improve it content, and even if you want, you can make a translation into your own language.